Migration is dedicated to crafting wines from the finest cool-climate winegrowing regions highlighting lush fruit, bright acidity and impeccably balance oak. Established in 1973, Bien Nacido has earned a reputation as one of California’s premier vineyards. Planted in the low-vigor soils of the Santa Maria Valley, the vines face the full force of the wind and fog off the Pacific. 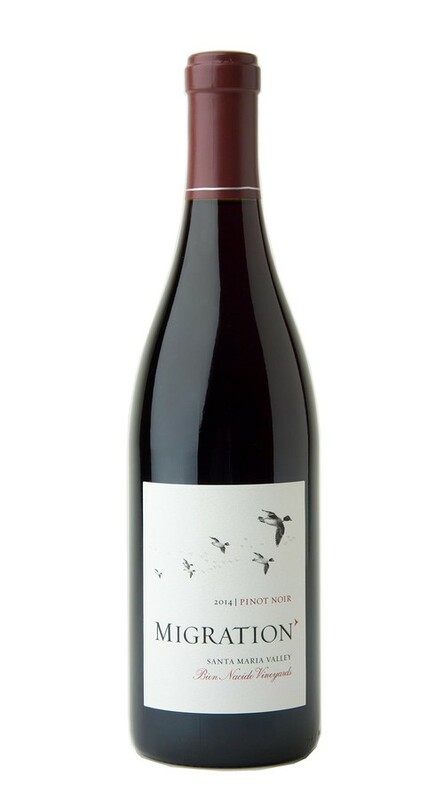 The result is a Pinot Noir that balances richness and elegance, with blackberry and ripe strawberry flavors underscored by enlivening acidity and notes of green tea and spice. This beautiful and inviting wine offers classic Bien Nacido Vineyard aromas of raspberry and pomegranate, followed by intense notes of fresh-ground white pepper and crushed rocks. On the palate, it is complex and giving, with abundant layers of fruit and spice that evolve in the glass as the wine opens up.